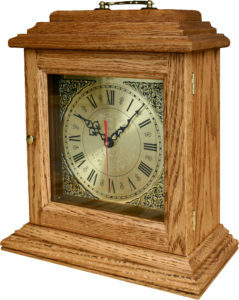 Mantel Clocks from Weaver Furniture Sales conserve space while adding a beautiful accent to your home. Like the antique look? Then, the Antique Shelf Clock – with its Roman numerals — is ideal. Or, if you’re going for a more modern style, the Mission Mantel Clock Without Chimes will nicely grace your mantel. Both timepieces have a quartz dual chime with manual chime silencer. Plus three different chime tones (Westminster, Whittington or St. Michael’s). Also, the builders included a German-made clock movement that comes with a two-year warranty. So there’s no better time than this to check out these exciting custom mantel clocks. Skilled Amish artisans painstakingly handcraft each Amish mantel clock. And the artisans use the finest regional hardwoods, top-quality German-made movements and traditional woodworking methods. As a result, the clock you select should beautify your family living space and tick away for many decades to come.